Whisk the golden syrup, alkaline water and oil together - it will take a while for the oil to mix with the syrup. Pour the golden syrup mixture into the flour and mix together with a rubber spatula until a soft dough forms. Cover the bowl with a plastic wrap and let the dough rests for 2 hours. Meanwhile, divide the mooncake filling into 50 20-gram pieces with some melon seeds. Lightly dust some flour on a table counter. Turn the dough out and knead a little until smooth. Divide the dough into 50 10- to 15-gram pieces. The extra dough would be used to shape the noses, ears and tails for the piggies and bunnies. Flatten a portion of the dough and enclose a portion of the filling in it. Shape it into a bunny / piggy. 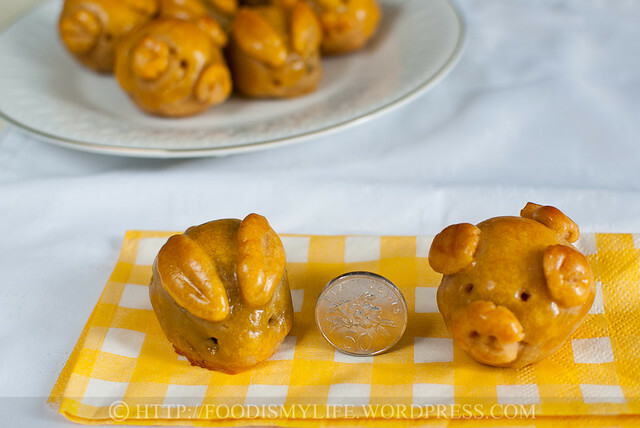 Pinch small pieces of dough and shape it to noses, ears and tails. Preheat the oven to 180 degrees Celsius. Line a baking sheet with parchment paper. Place the wrapped mooncakes on the baking sheet, 1-inch apart. Combine the egg yolks and the water in a small bowl. Brush the mooncakes all over with the egg wash and bake for 5 minutes. 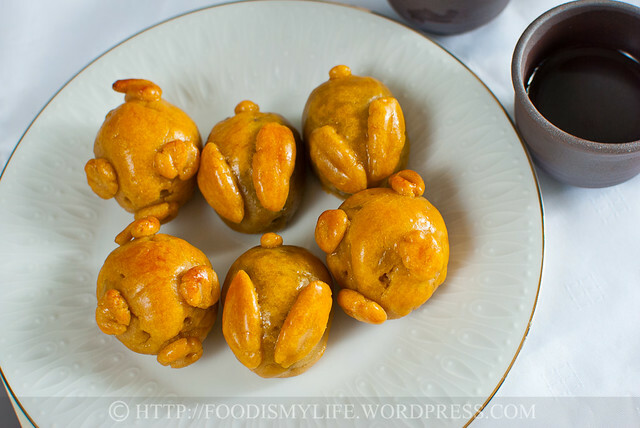 Remove the mooncakes and place on a wire rack to rest for 10 minutes. Lower the temperature to 175 degrees Celsius. 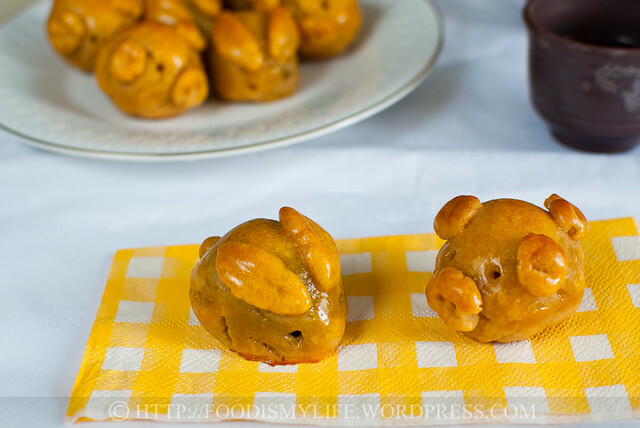 Brush the mooncakes all over with egg wash again and bake for another 10 minutes, until the dough is golden-brown. Place the mooncakes on a wire rack to cool completely. Transfer the mooncakes into an air-tight container and let the mooncake skin soften for the next 2 days before consuming. Super Naggy: I tweaked the method a little after some research on mooncakes. So it’s different from last year’s! For the step-by-step photos, please click here! Here’s wishing everyone a happy early Mid-Autumn Festival! These are so cute! Why did you have to make them so adorable? :)) These are like the cutest thing ever! too cute, jasline! one mouthful?? poor piggies! Jasline, these are a hoot! The little piggies just crack me up. Well done! Thank you 🙂 I didn’t want to buy the molds as I’m worried I’ll not make full use of them. Glad you like them! Thank you Mich! Happy Mid-Autumn festival to you! Thank you Karen! They are yummy to eat too! Awww thank you, make with your son during the holidays 😉 I’m sure it’ll be fun! Soooo cute! The pig is adorable! Jasline, these are so adorable! Well done! 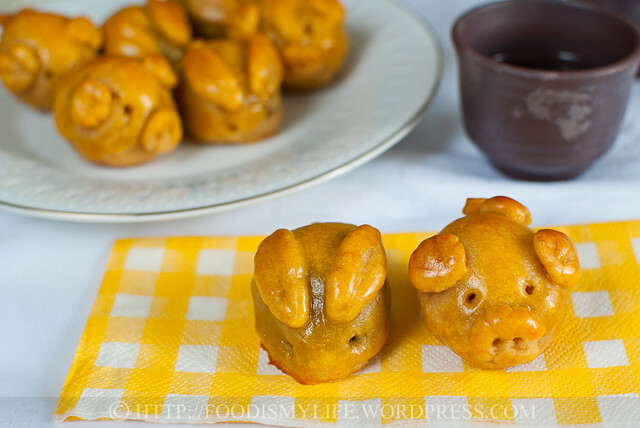 Your little moon cakes are so cute…especially the little piggies. Especially love the littl’ piggies! These are the cutest things ever…..Can’t let my son see them, or he’ll have me trying to make them on a school night!